Looking For A Vacuum That Can Deal With Pet Hair? So does this product work? Well yes, owner's of long-haired dogs are delighted to find that they can finally actually get all the pet hair out of their carpets. But why? How does it work? This Dyson animal vacuum cleaner does not depend on a bag. It uses the latest “root cyclone technology”, a trademark of the Dyson Company that can not be found in many of their vacuums. The root cyclone technology spins the air really fast. The centrifugal forces can reach up to a hundred thousand times of the force of gravity which fling dust and other unwanted residue and particles straight into the clear bin of the machine. The root cyclone technology also prevents Dyson machines not to lose their suction. This technology has even been enhanced by the Dyson Company combining this with a core separator. This is an extra cyclonic stage added between the inner and outer cyclones. These separate the particles of up to 0.5 microns in the airflow. The outer cyclone is where the dust, larger dirt and debris, and pet hairs are drawn to the machine’s clear bin. In the core, air would pass here, sieve, and redirect pet hairs and fibers that have escaped the outer cyclone into the clear bin. Then finally, smaller and faster cyclones extract particles the size of mold and bacteria in the inner cyclones. 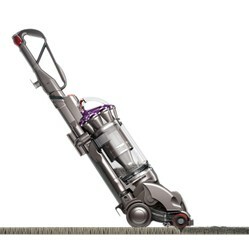 Another great feature of the Dyson DC28 vacuum is its so-called Airmuscle Technology. This technology independently raises the cleaner head’s brush bar closing the gap between the machine and the carpet. If there is no gap, then there would be no leaking suction. The manuevarability of the machine is not compromised too because of the Airmuscle technology, and the cleaner will work on all surfaces from tiles to shag-pile carpet. Engineers have also combined three different components with the Airmuscle technology. These are the powered cam, pneumatic actuator, and the high-torque clutch. The pneumatic actuator is the one that pulls the cleaner head to go deeper into the carpet to open the piles of dirt and pet hair stuck there. The powered cam focuses on suction, raising and lowering the brush bar for different types of floors while the high-torque clutch is the one that delivers and gives more power to the brush bar. This dislodges more dirt even in deep-pile rugs and carpets. Another advantage of Dyson cleaners, including this one, is that the Dyson company has a great reputation for customer service and quality. Unlike cheaper brands, you will be able to buy parts and accessories for your Dyson (lets face which pet owner has not lost an accessory or two due to puppy attack over the years?). The five year warranty says it all really. The American Asthma and Allergy Foundation also approves the vacuum for people with respiratory problems because the washable HEPA filter reduces the amount of mold and bacteria emitted from the unit. It also is the most expensive model. However refurbished units are available from time to time and these can offer great value for money. You may not get the fancy box, but you still get a clean vacuum complete with all attachments and a full warranty. However, with people who really need heavy duty cleaning; this pet hair vacuum cleaner is the perfect machine for them. I still like bags. If you're vacuuming up fleas and flea dirt, I'd rather fold up the bag and dispose of it. If you just dump it in the trash, they hop out. Fleas are always an issue down here where I am. Even if my dogs don't have fleas, I want to keep the environment flea-free. I don't have a vacuum with a bag now, of course because they're getting scarce as hen's teeth. I have to take it outside to clean it because of all the dust it raises. Of course it is nice not to have to buy bags all the time. I haven't tried one of these but sounds interesting. The Dysons really last don't they? You do get what you pay for in vacuum cleaners in my opinion, and as a pet owner, its unbelievable how much hair they shed! Dyson vacuum cleaners are the best! They are expensive but well worth the money. I don't have this model but I do have an older model and it is wonderful.